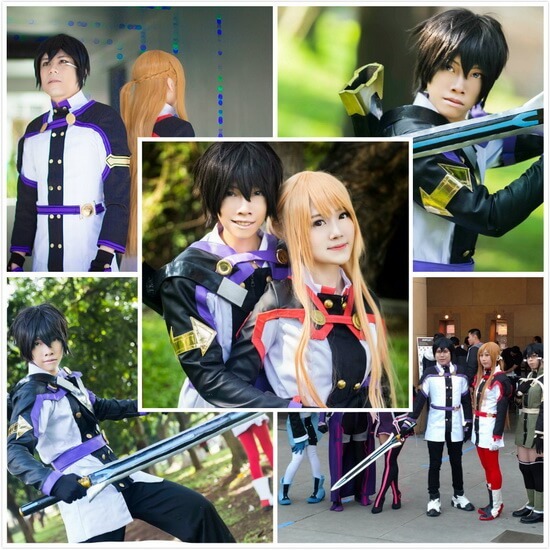 Sword Art Online (SAO) is a popular anime series that aired in 2012. 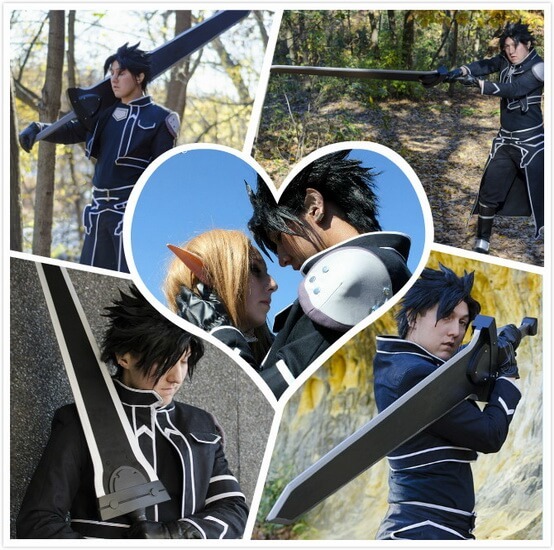 One of the main characters of the series is Kazuto Kirigaya, or commonly known as Kirito. He is known as the black swordsman because of his tendency to wear all black. He is also more of a solo player in the game, only joining a guild because of certain circumstance. Kirito’s cool appearance makes him a favorite by a lot of people to cosplay as, especially since it’s not that hardtop achieve his look. Throughout the Sword Art Online series, Kirito’s outfits all have a common theme, they should come in black. 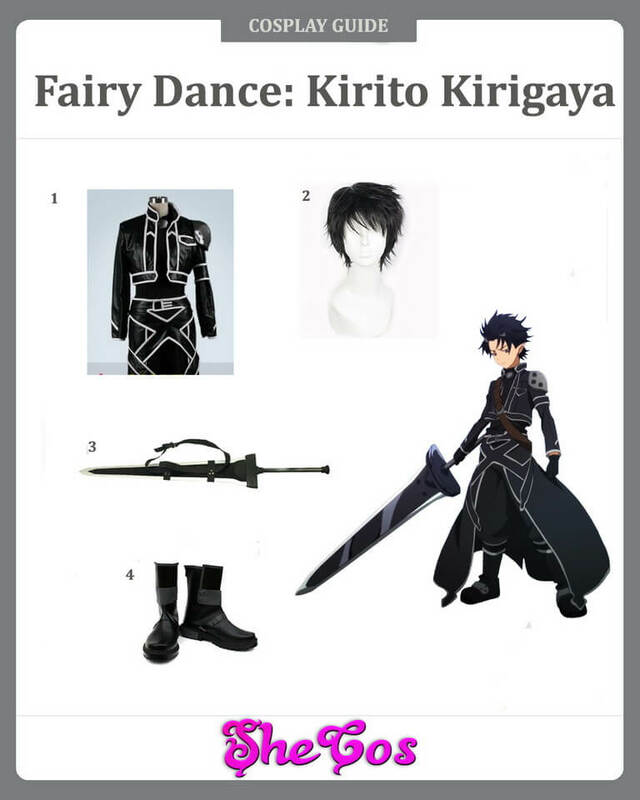 Whether if it is in Sword Art Online, the Fairy Dance Arc, or ALfheim Online, all of Kirito’s avatar would be wearing black outfits with just some variations for the design and style. About the only time, Kirito didn’t have an avatar that wears a black outfit is during the Sword Art Online: Ordinal Scale movie. There, Kirito’s avatar is wearing an Augma uniform that has a white top and black pants. For weapons, Kirito uses different styles and variations of a black sword. 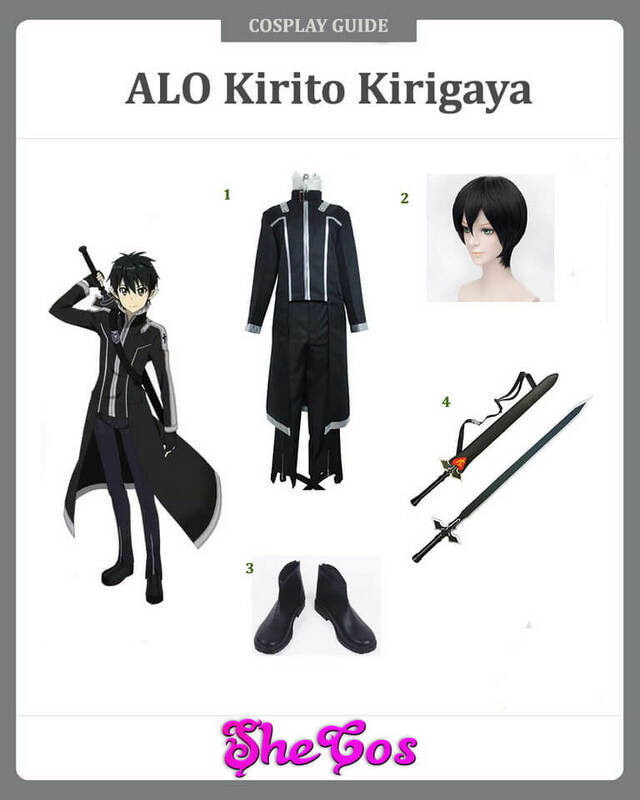 Let's show you the detailed guides for each Kirito costume. 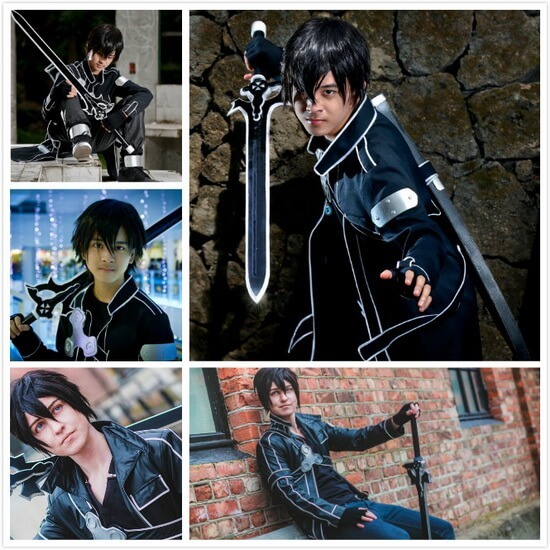 Kirito Kazuto wore a lot of different black outfits in the Sword Art Online anime series, but his most popular one is likely the black swordsman avatar that he wore in the original series. A lot of the people who cosplay this character will have this avatar in mind. He wears black pants with a black belt that has a large metal buckle and black boots that have metal plates. For the top, Kirito wears a black V-neck shirt and a black trench coat with grey linings. 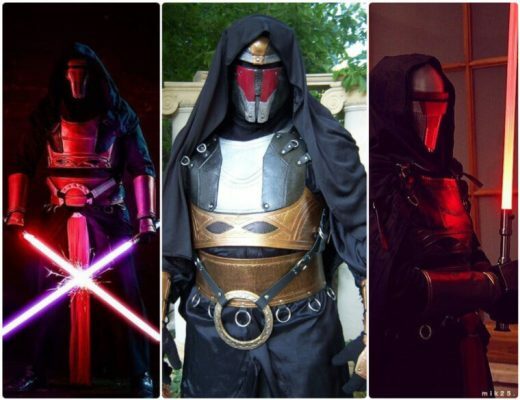 For the accessories, you will only need a black wig and a black longsword, which is known as the Elucidator. The black swordsman avatar that Kirito is known for is his first and main avatar when he became a player of the Sword Art Online game. 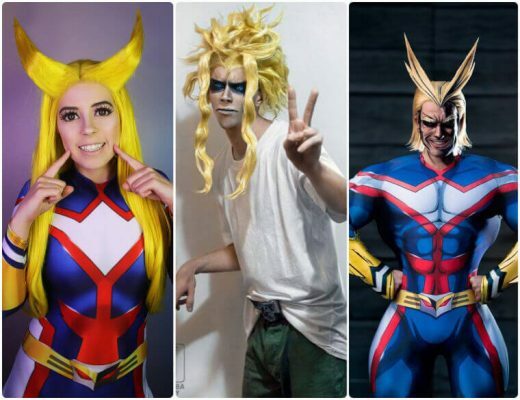 It is also the main cosplay costume that people try to imitate when they think of cosplaying this character. This avatar is not really known as the Black Swordsman, as this is just the name the other players gave Kirito because of his appearance. During this arc, Kirito is more a solo player and it’s because of his status as a Beater, which is a derogatory term used to insult players who participated during the Beta-testing phase of the game. Aside from Beater, Kirito also became known as a Clearer, which means an elite player that is at a higher level than anyone. During the Fairy Dance arc, Kirito chose the Spriggan race for his avatar. 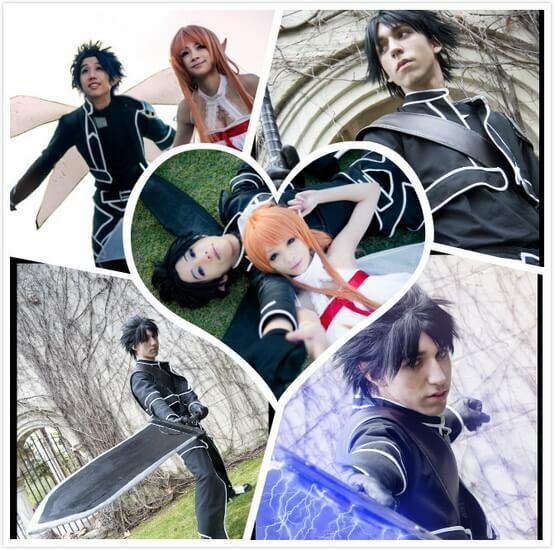 Here, Kirito is again wearing an all-black jacket and equipment making it again easy to cosplay. Kirito wears a black shirt with black pants in this arc. On top of that is a black crop top jacket with grey linings and matched with a long black skirt, also with grey linings, to make it look like he is wearing a trench coat. The look is made complete with black boots that have plates. For the accessories, you will need a short black wig and a large black sword. Kirito’s hair in this arc is a bit brushed up and spikey. The Fairy Dance arc is the beginning of the ALfheim Online saga but Kirito wasn’t initially a player in this game. He only joined because he wanted to search for Asuna, who was trapped inside the game. Since he didn’t plan on taking the game seriously, Kirito chooses the Spriggan race for his avatar because of the initial black theme of the race’s equipment. As he progressed in the game, though, he started upgrading his equipment to make his character stronger and enable him to reach the top of the World Tree and save Asuna. The appearance of his avatar here is a bit similar to that of his Sword Art Online avatar, except for the spiky hair. After Kirito’s initial Spriggan race avatar in the Fairy Dance arc, he changed his appearance to match that of his old Sword Art Online avatar. His spiky hair is gone and is back to his old messy hairstyle. He also has a new black trench coat here that’s a bit calmer in style than his ready-for-battle appearance in Fairy Dance. The coat still sports the grey linings. For the pants, you will just need black pants and all-black boots. For accessories, aside from the wig, you will need a long sword that’s narrower than what Kirito usually wields in his previous avatars. Kirito didn’t really plan on playing the ALfheim Online game seriously. But as he realizes that he needs to be serious here, he started to upgrade his character to make him stronger to take on the challenges ahead. When he logged in back to ALfheim after the incident in Fairy Dance arc, Kirito changed the appearance of his avatar to match that of his Sword Art Online avatar. The changes include his hairstyle and the outfit his character is wearing. His main sword also changed to a more narrow long sword. He also has other weapons, which includes the legendary Excalibur, But his main weapon is still the Dark Repulser. 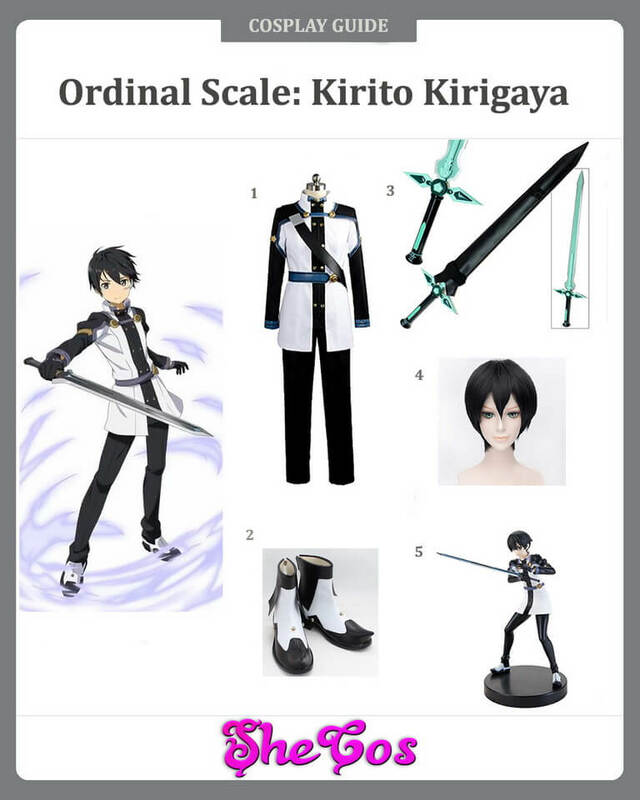 If you want to cosplay Kirito Kirigaya but you don’t like his black outfits, then you can choose the avatar he has in the Sword Art Online: Ordinal Scale movie. This is one of Kirito’s looks where he isn’t wearing his signature black trench coat. In the movie, Kirito is wearing the Augma uniform, which is a white military top with black sleeves and a thick black stripe in the middle. 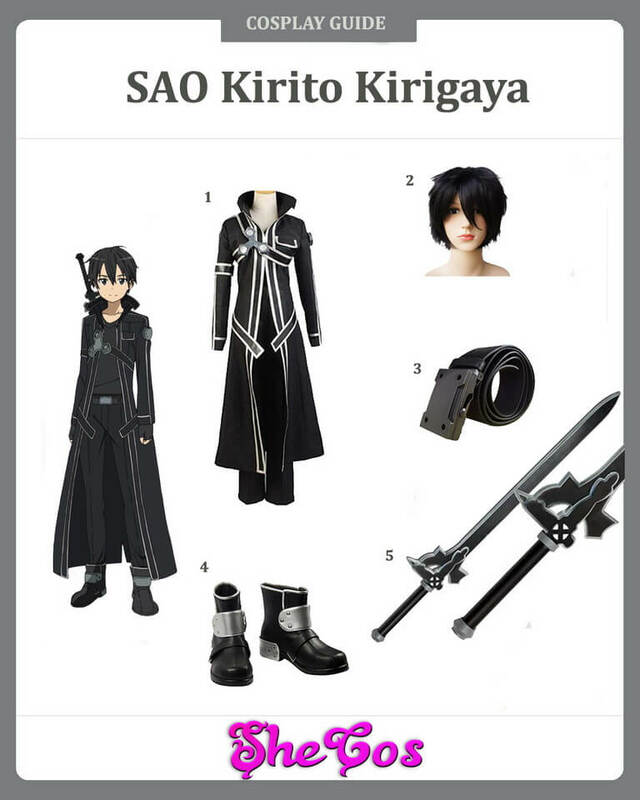 Kirito is also wearing black pants here and the Augma uniform boots, which is white that has black designs. For the accessories, it comes with a short black wig and a long sword. Kirito Kirigaya didn’t really plan on playing the Augmented Reality game called Ordinal Scale and was just content on letting the other characters of Sword Art Online, like Asuna Yuuki, play. But when something happened to Asuna during a boss battle in the game, Kirito entered the game. He started to participate fully when Asuna revealed that she is losing her memories of Sword Art Online and it was revealed that it was due to the Ordinal Scale game. With the help of his friends and Asuna, Kirito was able to defeat the last boss in the game, thus preventing other players from losing more of their memories.